Fitted bathroom furniture not only finishes off bathrooms beautifully, but it's also durable and perfectly designed to create the optimum practicality. 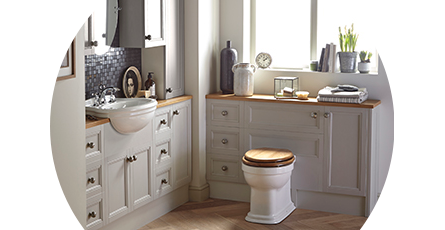 The Heritage Caversham Fitted Bathroom Furniture range is great for anyone looking for a classic, traditional style. The Caversham Fitted Bathroom Furniture range also comes with plenty of customisable features including a variety of handles, worktops and colours. Get a totally unique style of traditional fitted furniture by selecting your favourite colour from Oak, White Ash, Graphite, Oyster and Dove Grey. Heritage bathroom furniture is widely known for its style and quality. It's strong and durable, yet beautifully finished right down to the handles. With long guarantees and lots of options, it's hard to ignore the Heritage Caversham Fitted Bathroom Furniture range for your traditional bathroom.